Pressure cooker mac n cheese is perfect for the Instant Pot and uses just a few ingredients. 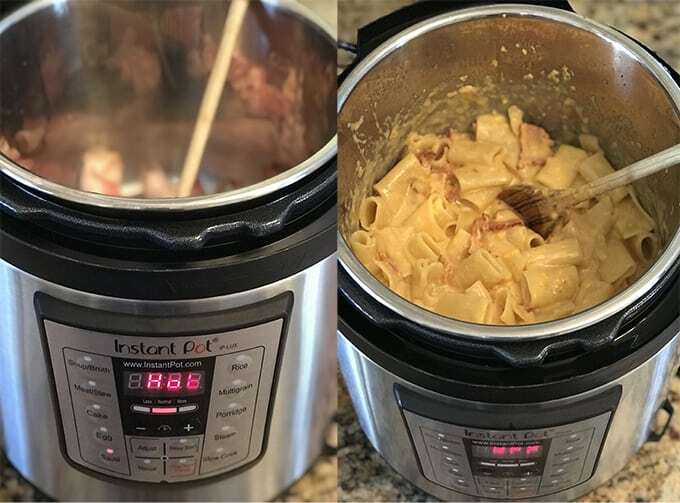 This recipe for pressure cooker mac n cheese first appeared on our sister food blog, Instant Pot Family Recipes. It all starts with our (Almost) World Famous Mac n Cheese Recipe which we converted into this pressure cooker mac n cheese. Possibly the best mac and cheese ever! 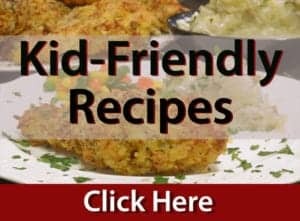 The ingredients for both mac n cheese recipes are the same, as are the results, making for a delicious and easy family meal. As I pointed out in the original post, this pressure cooker mac n cheese is creamier than the original recipe. It is not baked in a hot, dry oven and for this very reason, we are making this Pressure Cooker Mac n Cheese the taste winner of the two. 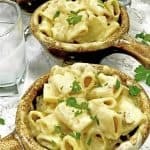 Pasta dishes and macaroni and cheese in particular are popular American family recipes and once again I think there is a wide misconception about what the Instant Pot is capable of doing. The Instant Pot doesn’t think for itself. That’s up to you, the operator. Different pastas cook differently. Spaghetti will cook differently than elbow macaroni which will cook different than penne pasta. You get the point. For my macaroni and cheese I always prefer the rigatoni style pasta which I buy at Aldi. 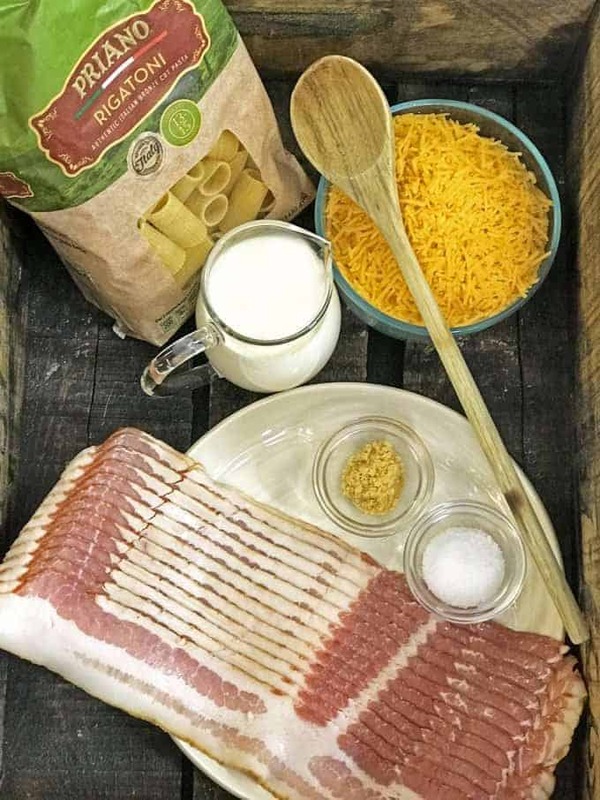 The large and round tubular rigatoni pieces hold the sauce and and make for a great vehicle to carry the flavors of the cheese, cream and bacon in this macaroni and cheese dish. I found that using my rigatoni of choice along with 4 cups of water and on a manual setting of high for 4 minutes works perfectly for this pressure cooker mac n cheese. Depending on the style of pasta that you use, and maybe even the brand, you may have different results. Experiment with your Instant Pot by picking up an extra package of your favorite pasta and do a couple of dry runs. Your goal is to find the right pasta, the right time, the right setting, and the right amount of water for pasta that is not over cooked and mushy but instead has a firm al dente (to the tooth) bite. 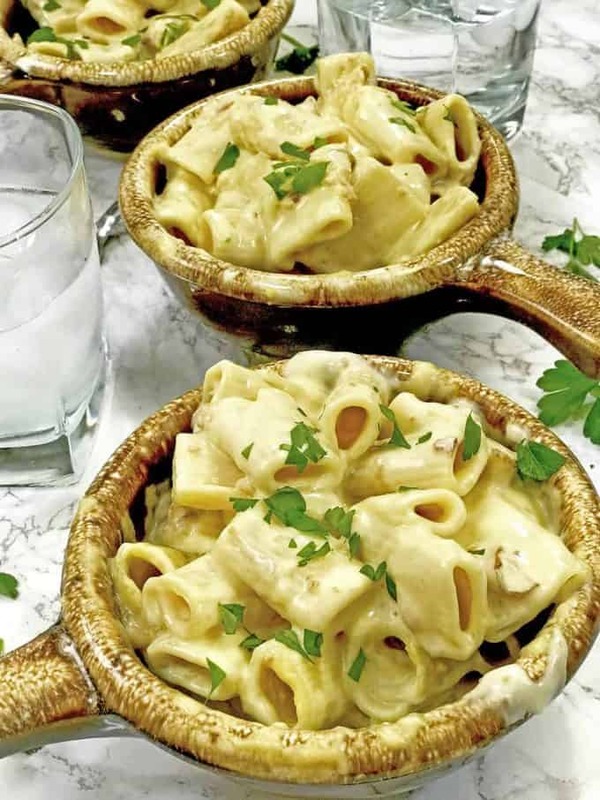 Give this pressure cooker mac n cheese recipe from your Instant Pot a try. 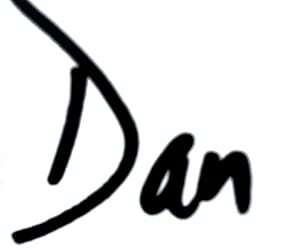 I know you’re going to love it. Check out our Instant Pot Cooking Video (in the recipe below) of this Delicious Mac n Cheese! Do you have a favorite style or brand of past for your mac n cheese? We want to hear from you! Place olive oil in Instant Pot and turn to sautée, medium setting. When oil is hot, place bacon in Instant Pot and stir until fried down to desired level of crispiness. Turn Instant Pot off and drain water and fat from bacon and then return bacon to Instant Pot. 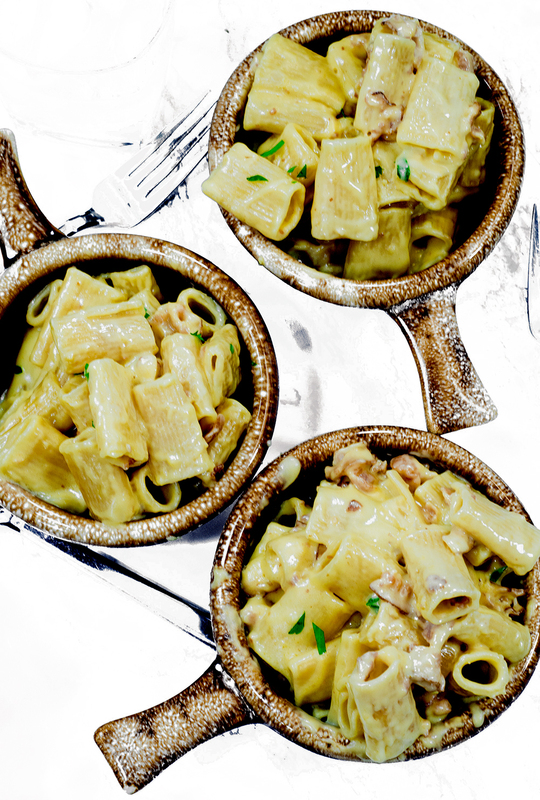 Place pasta in Instant Pot, on top of bacon. Add water and place cover on Instant Pot making sure that vent is in "sealing" position. Select manual setting (high) for four minutes. Do a quick release at end of cycle using caution to not get burned from the steam. 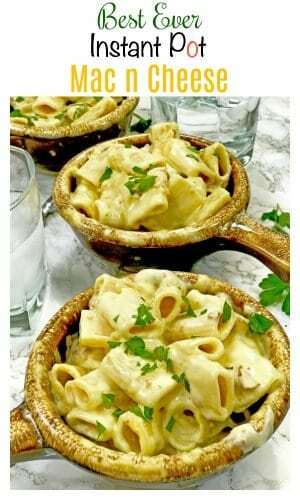 Select sauté function (low setting) and use a large wooden spoon and stir in cheese, cream or milk, salt an mustard. The excess liquid will get absorbed by the pasta with a couple of minutes of stirring and a little heat from the sauté feature. If you want to thicken the mac n cheese a bit, sprinkle in a bit of flour to desired consistency. Serve immediately, or place cover on Instant Pot with vent open and Instant Pot turned to "keep warm" setting. Alternatively, you can place the mac n cheese in an oven safe dish, place it in a warm oven to keep warm or under the oven broiler for a minute or so to brown the top. Looking for something to serve with this Pressure Cooker Mac n Cheese? 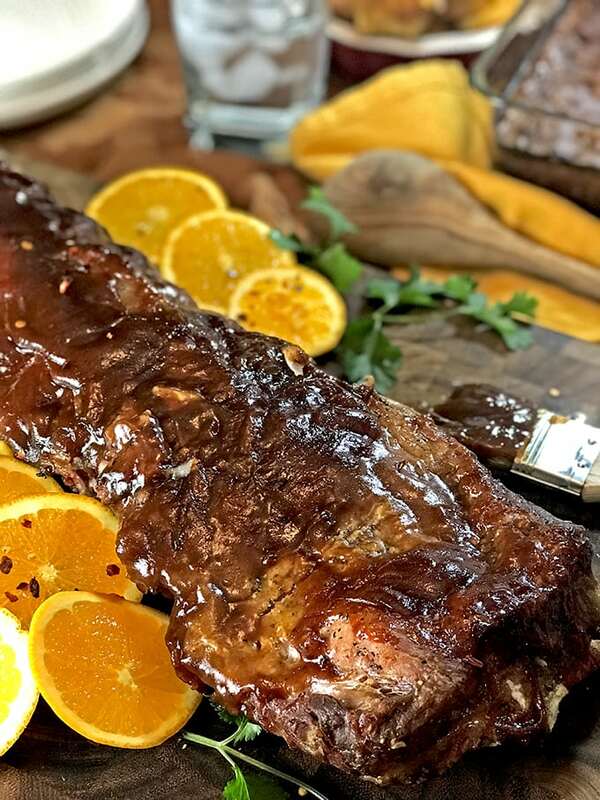 Give these Instant Pot Ribs a try! 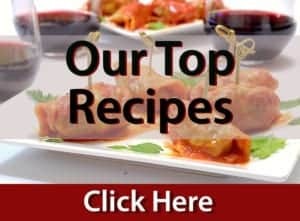 We made this recipe this past weekend during our ski lodge and everyone loved it. Instead of bacon, I used some leftover ham from the recent holiday and the crowd went wild over it. Thanks for the super easy idea. It’s a keeper in my book! Thanks for the great comments Sally and I love that you took what you had on hand and used some ham instead of bacon as originally called for. I’m keeping that trick in my bag for the next time I make it too! Thanks again for the nice comments and thank you for reading Platter Talk!